I just adore paisley (boteh) designs which probably originated in Persia. The East Indian company imported Kashmir shawls and other luxurious silk products with these designs printed on them and they have never gone out of fashion. Where better to start than with a paisley themed crazy quilt block incorporating two large paisley appliqués to increase its beauty. 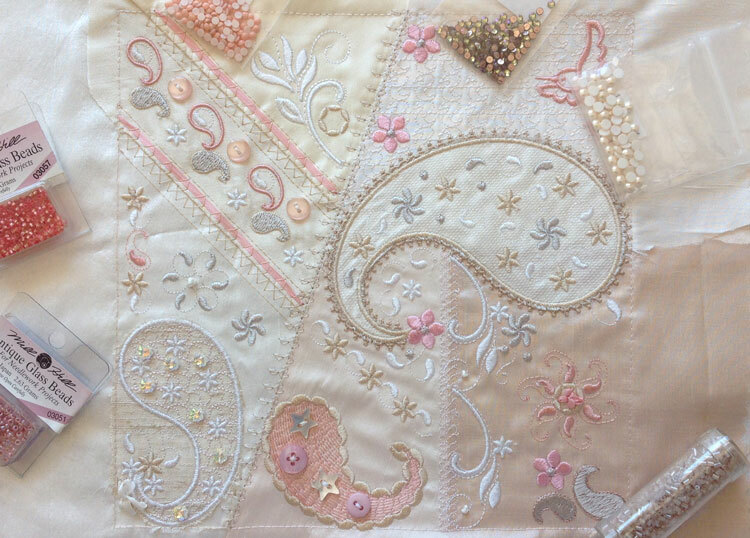 This is probably the most challenging of my Crazy Quilt blocks but I think you will enjoy creating something very special and unique. I hope you like the results as I did when I first saw it stitched out. I immediately saw a future collection of delicate lace paisley designs developing out of this block, but more about that another time! Notice that I have kept to corals, pinks, and creams with just a hint of grey green. Here is the 8″ by 8″ hoop as I began to embellish it. 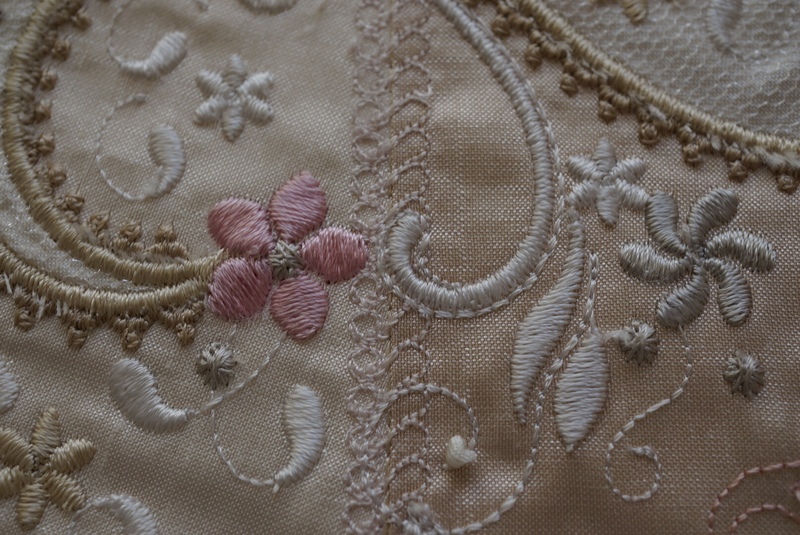 I used some lovely creams, coral and pink shades on my silk fabric pieces which included some precious silk duchesse satin. Crazy quilting is perfect for using up those small fabric remnants that you are reluctant to part with as they are very precious and have too many memories to be thrown out. Out came my buttons, sequins, crystals and trims to find the perfect selection for embellishment. Why is it so hard to find tiny buttons for crazy quilts I have to ask? Most of the buttons that I pick from my stash are always just too big. 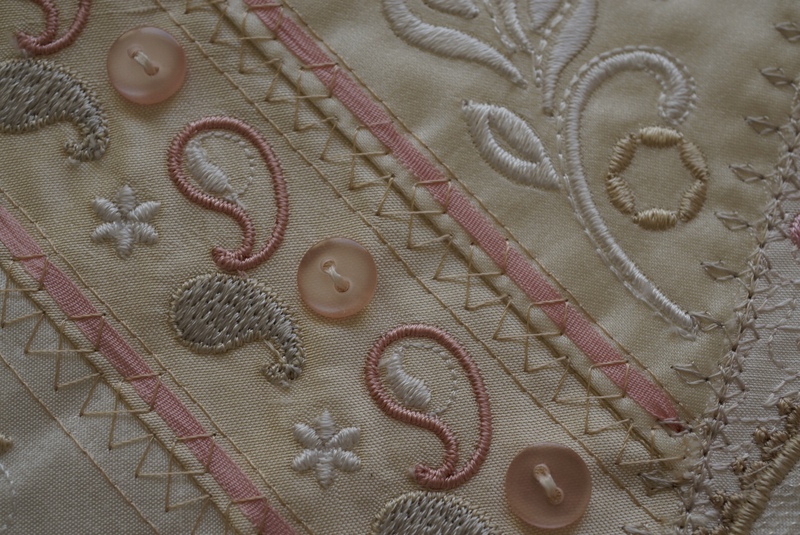 I know you will let me know of any on-line shops for crazy quilt supplies that stock tiny buttons. There are some large open stitches in this block which were great for just carefully threading silk ribbon underneath. This area of the block needed more colour so it helped balance the quilt. I added some tiny silk ribbon knots in ivory 4mm silk. The more I sew with these delicate ribbons the easier it gets. The secret is to not have too much ribbon at a time as it “spoils” the more it is drawn through your fabric. There is also an art to prevent it from twisting. This rose in the centre of the wreath of little paisley designs did not do what I wanted it to do but I shall add some pearls to fill it out so it won’t matter. Up until now I have been using stitch and tear as my stabiliser but I am considering looking for alternatives which will leave my blocks softer as a great deal of the stabiliser cannot be removed due to the closeness of the stitches. 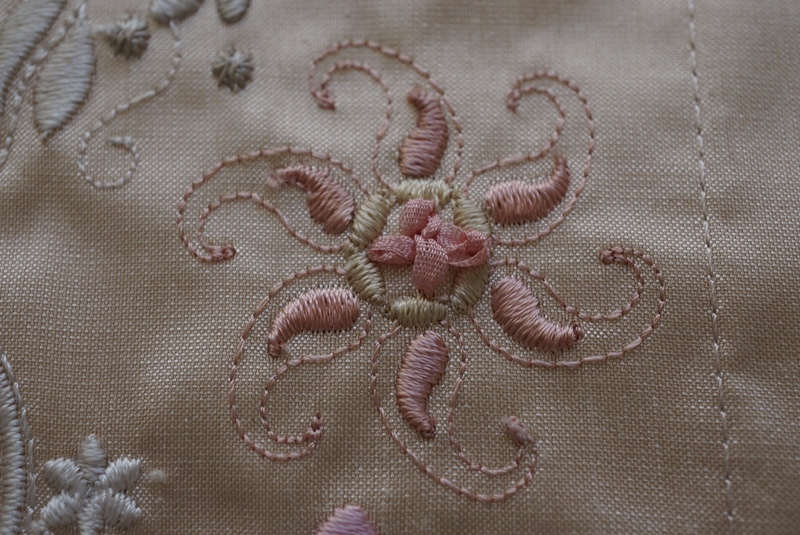 For the smaller block shown here I used my lovely pale gold duchesse silk satin again for the paisley applique but trimmed it after it was finished for a different look. As you can see the smaller block only has 3 fabric layers added and then one applique but the larger block has 5 fabric layers added as well as two appliques. I added tulle to the larger paisley applique. There is only one problem with embellishing your quilt blocks and that is knowing when to stop. 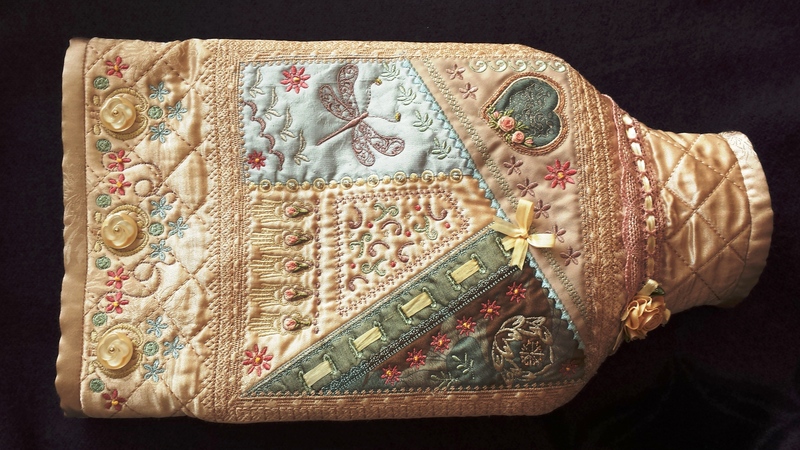 This Romantic Crazy Quilt block is my 6th and can be purchased from April 19th, 2015. 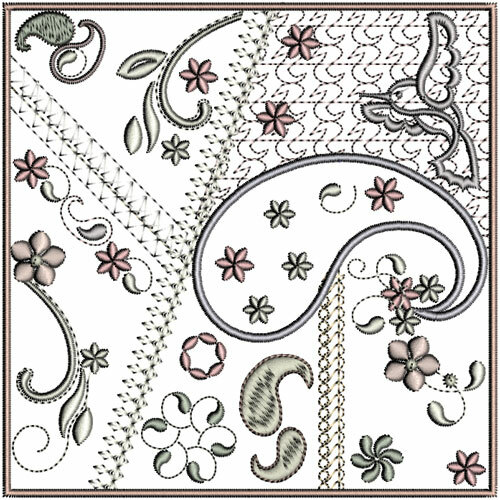 I have been considering my next Romantic Crazy quilt block already and I think I may break with tradition making it rectangular. Not being limited to 8″ square would be very liberating and I could add more fabric, stitches, techniques and elements. A quilt block which was 12″ by 8″ could be used for so many projects like small tote bags. I remember showing my first block to my little granddaughter and she thought it was hers to keep but the embellishing was not secure enough for a young child with a sister even younger but if prepared carefully would make a lovely bag for them both. After all these designs look good even without embellishment! Before I go I would like to show you a gorgeous hot water bottle cover made by Marilyn from my first block! The article for creating this in the current issue of Innovative Machine Embroidery and Textile art. When I saw it I was delighted hardly recognizing my designs! 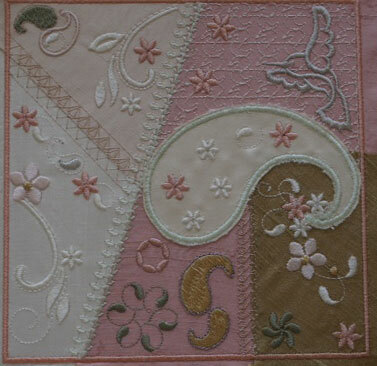 This entry was posted in Discussing machine embroidery, Embroidery projects, New Designs and tagged Crazy quilting, Embellishment. Bookmark the permalink. The blocks are beautiful. I can’t find where you posted how many bobbins you used. I guessed 2 pre wound ones. I like to use no show mesh for my crazy quilting. I have very good results from it. Gorgeous as always, Hazel! 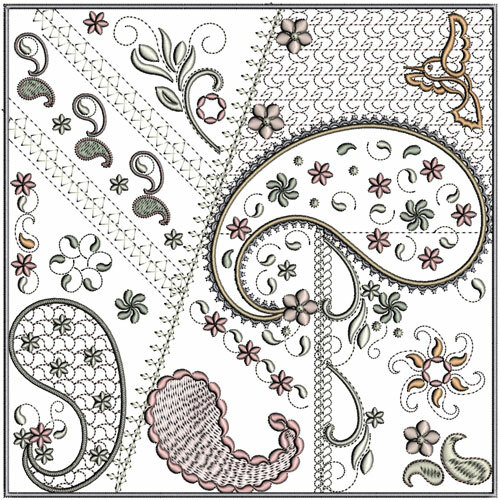 Your crazy quilt blocks are always beautiful and always works of art. Well, every thing you do is superb! Thanks for sharing your talent! About the applique scissors, I like to use small, with curve point & sharp point to move it up & not cut the design!